AVELINE -Stockholm, ville capitale du royaume de Suède. AVELINE, P.A. - Stockholm, ville capitale du royaume de Suède. Stockholm, ville capitale du royaume de Suède. - AVELINE, P.A. 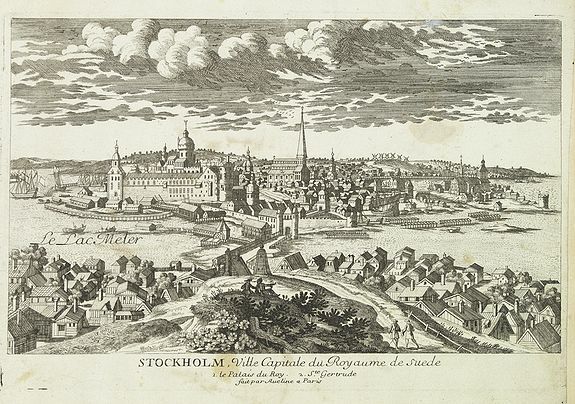 Title : Stockholm, ville capitale du royaume de Suède.. Size : 7.5 x 12.3 inches. / 19.1 x 31.2 cm. Description :A very decorative and extremely raretown-viewof Stockholm, including a numbered key ( 1- 2 ) in lower part. Engraved by Pierre-Alexandre Aveline. With "fait par Aveline a Paris" in lower margin. Condition : Good and dark impression, laid down on paper. Paper slightly browned, with a light brown spot in lower part.